This silver monogram ring sit like a crown on the finger, displaying an intricate design of family history. The Sterling Silver Monogram Ring is a beautiful piece that is both subtle and bold at the same time, with a simple silver band supporting a striking three-initial monogram. You can be proud to wear this ring on your finger, as it displays such a rich and beautiful message. This lovely ring is cast in sterling silver and features a monogram design measuring 13mm by 9mm. The monogram contains three initials of your choosing with the most prominent initial placed at the center. A decorative border is added to the three letters, turning them into one solid piece. The carved letters leave space for light to amplify the design, creating soft shadows in and around the monogram and giving it an aged appearance. The silver band (3mm - 5mm) features rounded edges for a comfortable fit, as it widens slightly from back to front to support the monogram at its center. This silver ring is a wonderful piece of jewelry to own because it is so very personal. By using your initials, the monogram becomes an original work of art that holds a very special meaning to you and those who know you. 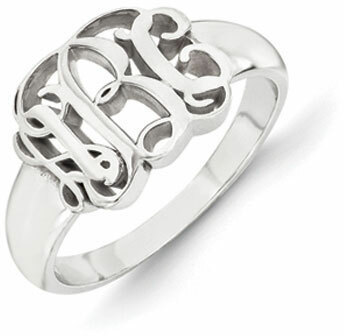 We guarantee our Sterling Silver Monogram Ring to be high quality, authentic jewelry, as described above.